Without a solid foundation one will have trouble creating anything of value. Our air conditioned Nursing Foundation lab enables the students to gain adequate knowledge regarding basic procedures through which the firm foundations of the fundamentals of nursing will be laid down. To nourish the foundation our spacious lab is well suited with patient many simulators on which students will be taught the preliminary training of patient care. Pre-clinical Science lab provides comprehensive knowledge of microbiology, anatomy, physiology and biochemistry. This lab is designed with excellent infrastructure, equipped with various specimens, models, slides and charts. Therefore, the students can have more understanding related to the structure and physiological process of various organs and systems of the human body. This lab also helps in developing deeper knowledge and skills among the students which will help them applying it on clinical and theoretical grounds. Community Health Nursing lab is a miniature of community setting be it be a rural or urban. It is a stimulated home environment that allows nursing students to practice their community health skills in a life like scenario. Our CHN lab is therefore an extension and expansion of the ideal guidelines of nursing. It has all the necessary measures, equipments that will thereby help our students to face any challenges in the community. Maternal and Child Health lab provides comprehensive knowledge and it focuses on training of all the essential skills required to work and perform as able midwives. The infrastructure of lab is designed to help the students to learn the maximum within the four walls making all the necessary equipments and articles within their reach to later function well as a paediatric nurse or a midwife. The advance skill lab aims at teaching and training students the essential advance nursing skills to provide overarching care for adult patients suffering from variety of disease conditions. It prepares nursing graduates qualified in the care of the adult patient according to the highest standards of nursing care. 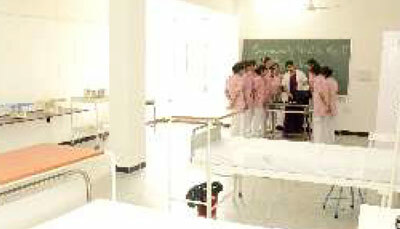 This lab also provide hands on learning experiences specific to course objectives as directed by the nursing curriculum. Nutrition lab facilitates learning by providing the faculty and students with the settings, models, equipment and supplies necessary to develop skills regarding nutritious diet for a patient. Our college has state of art nutrition lab with all modern amenities for teaching therapeutic diet for the patients. Students get excellent training in nutrition and dietetics during their course of studies. Our air conditioned computer lab is well suited and designed with latest computers with world class software enabling the students to match the pace of the world around them. All computer units share local area network.